There are two particularly interesting aspects of Liang Xiao Yin. First, its opening phrase is intriguingly similar to the opening phrase of the Shen Qi Mi Pu melody Wu Ye Ti. However, this may just be coincidental, as there seems to be very little other connection between the two. Zuiweng Yin (Old Toper's Chat) as printed in Taoshi Qinpu (late Ming; more details here). Zuiweng Yin sets its version of the Liang Xiao Yin melody to lyrics. Cangwu Yin is also very similar to the Liangxiao Yin that first appears in 1614.8 The title Cangwu Prelude suggests it should be used as a prelude to the jiao mode melody called Cangwu Yuan (Cangwu Lament), which is a lament on the death of Emperor Shun.10 However, the 1596 handbook has no Cangwu Yuan and its Cangwu Yin actually comes just before a version of Liezi Yu Feng, with which is has no apparent thematic connection.11 And although the second handbook to call this melody Liangxiao Yin (1647) does use it as a prelude to Cangwu Yuan, at least until 1722 it more commonly continued to precede Liezi Yu Feng or even the zhi mode melody Yu Hui Tushan. Wenhuitang Qinpu has no commentary on any of its melodies, nor does Songxianguan Qinpu. It is thus difficult to say whether this melody called Cangwu Yin only in 1596 really did come first, and if so how it came to be called Liang Xiao Yin in 1614.12 And although seven later handbooks do have commentary on Liangxiao Yin,13 the earliest commentary is not until the sixth handbook (1692), and the only preface with specific claims about the melody's origin is one published 250 years later, in Tianwenge Qinpu (1876). Here it is attributed to a Sui dynasty general with literary talent, Heruo Bi.14 Presumably this attributation is due to the fact that Heruo Bi is said to have created a melody called Qingye Yin,15 which has the same meaning, but Tianwenge Qinpu itself does not specifically make a connection with that title. Thus, because of the dual title and since none of the other prefaces makes any comment on the origin of the melody, one can only speculate as to what its original title might have been, or its age. As for its aim, early poetic references suggest there is no reason to think that it is anything other than simply to evoke the mood of a peaceful evening, either at home or in nature. However, later references might suggest a couple having such a peaceful evening, and the lyrics of the song versions suggest also someone in the quiet of an evening thinking of their separation from a loved one or loved ones. This title could also be given such translations as "clear evening" (see the comment with Qingye Yin), "lovely evening", "happy evening", "enjoyable evening" and so forth. With regard to the latter see the comments below concerning the illustration above. Fishing from a boat with qin and wine; a peaceful evening with our backs to the shore. 9/263 also gives two further definitions for 良宵 liangxiao: "長夜，深夜 deep into the evening", and "元宵節得夜晚 evening of Yuanxiao Jie“, the 15th day of the first lunar month (a full moon), also called Lantern Festival. This "元宵節 Yuanxiao Jie" is sometimes called "Chinese Valentine's Day". For more on jiao mode see Shenpin Jiao Yi and Modality in early Ming qin tablature. For more on Gao Made see a relevant article. The above image was viewed cached in 2009 at www.shuobao.com/arts/d27789.html, where it was for sale. An image search for "良宵圖" gave numerous hits showing famous couples out in public for a "peaceful evening". The early references above do not suggest this type of evening, but references from after 1600, when Liangxiao Yin first appeared, seem more mixed (see also the lyrics below). Zha's Guide 30/236/443 lists Liangxiao Yin in 31 handbooks from 1614 to 1914, but as the chart below shows, it can actually be found in over 40 surviving handbooks: most of the extras are from 19th century handbooks not indexed in the Zha Guide. The Guide copies out the prefaces for one version (in 1876), afterwords for seven more (see list), and section titles for one (1730, q.v.). All versions have very similar music, whether in two sections or three ("+1" in the chart means the harmonic coda is written as a separate section, but this distinction is not made consistently). The 1596 Cangwu Yin (VI/226) is also very similar, its differences mentioned here). Not yet translated. The melody here is little different from the common instrumental version; the pairing is sort of done by the traditional manner, but if so seems to have been done by someone not familiar with the tablature; for example, some characters are paired to symbols that don't even represent notes. I have tried to order the phrases above so they fit the musical phrasing, but to me it seems quite awkward. Also not yet translated. Not having the actual 1876 tablature makes it difficult to assess how fluent the pairing is and I have not tried to see whether these lyrics from the 1876 edition pair naturally to the tablature in the 1894 edition. As can be seen, the lyrics of these two are completely different from each other. Several of the afterwords comment on this as a beginners' melody, adding however that it is very elegant. My teacher Sun Yü-ch'in said that anyone can impress people with a flashy and/or complicated piece such as Liu Shui: you practice it a lot and then just play. What in fact were often the most difficult pieces had melodies that at first seemed the simplist. He said this specifically about Xiang Jiang Yuan, but from the commentary here it seems that this is said even more often about Liangxiao Yin. The main difference between Cangwu Prelude and the first Peaceful Evening Prelude is that the latter inserts extra notes and ornamentation throughout and also repeats the first stopped-sounds phrase in each section of the body. As for theme of this Cangwu Yin, although its title suggests that it should be a prelude to the melody Cangwu Yuan, as pointed out in a footnote under Cangwu Yuan, all but the first of the five entries called Cangwu Yin (see Zha's Guide 28/221/--) are in fact versions of Cangwu Yuan. This first one, from 1596, has no apparent musical relationship to Cangwu Yuan other than being in the same musical mode (jiao); instead, for an unknown reason, it became a predecessor of Liangxiao Yin, to which as mentioned above it is closely related throughout. Here it might be mentioned that the old melody Yin De as modified in 1614 was given the new name Qiu Jiang Ye Bo. Wenhuitang Qinpu (1596) has no commentary on individual melodies, and it places Cangwu Yin just before the melody called Liezi (a version of Liezi Yu Feng); it does not include a Cangwu Yuan. On the other hand, Songxianguan Qinpu does include a Cangwu Yuan, placed two entries earlier than Liangxiao Yin; only Huiyan Mizhi (1647) places Liangxiao Yin before the Cangwu Yuan melody. Neither of these two handbooks has commentary on individual melodies; and Songxianguan Qinpu does not follow the earlier custom of placing short melodies before related longer ones. However, the 1647 handbook does follow this custom, so it seems likely that its Liangxiao Yin was indeed intended a prelude to its a version of Cangwu Yuan - except that it calls its version Cangwu Yin (Cangwu Prelude)! 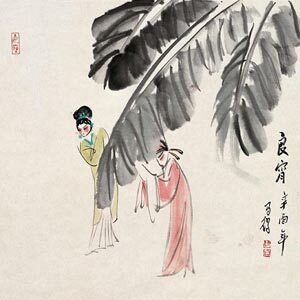 In the notes (Chinese only) for Liang Xiao Yin on her double CD 嘯樂琴韻 Qin Sounds Calling to the Moon, 李楓 Li Feng mentions the connection between Liangxiao Yin and Cangwu Yin, adding her opinion that Cangwu Yin quite likely originated as a prelude to Cangwu Yuan. Compare my comments above. Although Wenhuitang Qinpu does seem to try to pair melodies with apparent prefaces (see its ToC), there is no apparent connection between Liezi and the Cangwu region. As for Liangxiao Yin, although it also has no apparent conection to Liezi, the early versions (listed in the appendix) still generally precede Liezi Yu Feng (alternatively: Yu Hui Tushan). Later it is more rare to find handbooks arranged so that melodies are preceded by preludes. 12. Which version came first? The dates 1596 and 1614 are close enough that it is possible the title Liang Xiao Yin actually came first, but the fact that the 1596 version (which was attributed to Hu Wenhuan of Hangzhou) is simpler also supports the likelihood that its version earlier. An internet search for "Liangxiao Yin", "Liang Xiao Yin", will show various other commentaries as well as recordings. "Qing" can also mean "clear". Although this title is the seventh entry in the Heruo Bi melody list, there is no reason to think there is any melodic connection. There was also a melodically unrelated Qingye Yin published in 1525. Most melodies as actively played over the years as Liangxiao Yin undergo gradual, often considerable, change. Some such melodies in the modern repertoire have reverted to earlier forms as a result of studying the original tablature, but a preliminary examination of earlier tablature for Liangxiao Yin in fact suggests that it has changed over the years it relatively minor ways. Because Songxianguan Qinpu is attributed to 嚴澂 Yan Cheng, also known as 嚴天池 Yan Tianchi, and he is considered to be the founder of the famous Yushan school, one can speculate that it was due to respect for Yan Tianchi, perhaps combined with the fact that it was treated as a beginners' melody, that Liang Xiao Yin did not change very much despite its popularity. Xu Jian's three examples are in Qinshi Chubian, Chapter 7.B.5. (p. 143); they correspond with the transcriptions on the first, then second and third, then sixth lines of Guqin Quji, Vol. 1, p. 226. In addition, his first corresponds with measures 1-6 of mine; his second corresponds with my measures 7-14; his third corresponds with my measures 26-28. Note that the other transcriptions consider the open first string as C while, because I consider the open third string to be do, C is played on the open third string. The transcription is in Guqin Quji, Vol. 1, p. 226. It is not stated whether the tablature was made to follow Zhan, or whether it is copied from a handbook and Zhan was following that handbook. In any case, it is not, as stated, from Songxianguan Qinpu. This melody, although it only has two sections, has harmonious sounds that are highly elegant, with the charm of softly lingering while reaching up to the clouds. Players who pay it special attention perceive this intuitively, and with confidence in it have a happy and calm mind, not considering this composition as lacking and thus disdaining it. Thanks to Chang Peiyou for help with translating the final part. The melody, which also has lyrics, is still quite similar to the original. Further comment above; based mainly on Zha Fuxi's Guide 30/236/443. Precedes Liezi Yu Feng: used as a prelude to it? (1722; XIV/479) 3; jiao yin; "熟派 Shu School"; no other commentary (unusual for this handbook). This is basically same melody as in 1614 but it is divided differently, with several notes near the end of its Section 2 changed to become doublestops. (1755; XVI/236) 2; jiao yin; "歷下金子陵授"
(1884; XXVII/300) 3; jiao yin; 熟派 Shu pai; "see 1722"
(1894; XXVIII/___) 3+1 (compare 1722); title: 良宵母律 Liangxiao Mulü; 黃鐘均宮音 huangzhong jun gongyin (compare ~1839); lyrics completely different from 1730 (the only other version with lyrics). There is no melody called Liangxiao Mulü in QQJC. The afterword here is also different from those in the Guide (481) 237. Zha Guide (967) 443 has the lyrics, saying they are from the 1876 edition; (231) 189 says they are attached to Liangxiao Yin. Does this mean that the 1876 edition had only a Liangxiao Yin with no lyrics and placed next to it (i.e., not paired) a Liangxiao Mulü with lyrics but no melody?